The Simpson PS4240-S PowerShot embodies a Honda engine with PowerBoost technology that starts at the push of a button and runs effortlessly powering through the very last speck of dirt has cleared. This pressure washer packs 4,200 psi ensuring enough pressure to clean stubborn stains and dirt that can settle on surfaces. In fact, the steel-braided hose is perfect for such extreme pressures, releasing it at a steady pace so as not to mar the surface that is being cleaned. The nonabrasive hose boasts quick connectors that aid in speeding up the cleaning process together with a range of nozzle tips of 0, 15, 25, and 40 degrees along with a soap applicator that can be fitted on to the sturdy steel spray wand for cleaning tricky surfaces. Although this is a heavy duty gas pressure washer, it is not unwieldy and is quite easy to maneuver along with being great for different types of surfaces including grimy decks, wood surfaces, and concrete or marble surfaces. Delivering 4.5 GPM, this model from Simpson is easy to transport to any location, and the high-pressure nozzle ensures strong jets of water that can complete most cleaning tasks efficiently. When compared to any other electrically operated pressure washer, the great disadvantage with a gas operated pressure washer is probably the awful noise that the equipment makes while on and running. 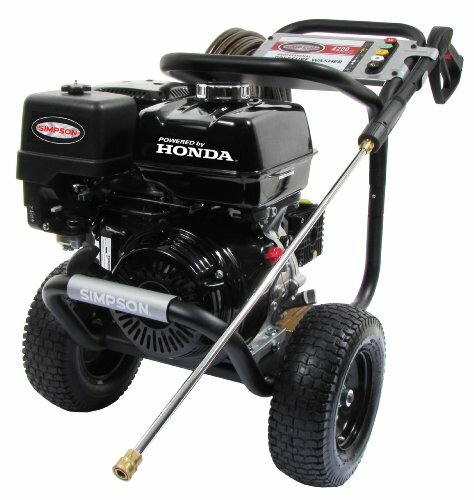 With this Simpson gas pressure washer, the noise levels are higher than the prescribed decibel limit, making it difficult for you to be heard while the engine is on. This is irrespective of the pressure level maintained, so at least you won’t have to cower behind cover at high pressures. The greatest advantage with a gas powered pressure washer is the immense power it packs. This extremely powerful piece of equipment renders even the toughest and most stubborn cleaning tasks easy and effortless. With 4,240 psi and 4.0 GPM raw power, the PS4240-S displays unmatched potential and is one of the best pressure washers for cleaning the patio and scrubbing off graffiti. The Simpson PS4240-S PowerShot features a set of 5 quick connect nozzle tips made of high-grade stainless steel and a steel braided high-pressure hose, which is ideal for cleaning grime off oily decks, wooden surfaces, areas that need a fresh coat of paint, and removing stubborn graffiti from walls. Additionally, the engines feature AAA triplex plunger pumps of industrial grade that are equipped with the unique PowerBoost technology making most cleaning tasks easy. This heavy duty gas pressure washer is built tough and its welded steel frame makes it perfect for use in the harshest environments. In fact, the solid and durable heavy-duty steel axles that are mounted on pneumatic tires make this machine sustain the extremes without any damage. Moreover, the hose is built to withstand extreme pressures and has high-grade steel braiding to extend its life considerably. As far as maintenance goes, winterization is standard with the engine. You probably don’t have to change or replace anything in its entire lifespan however owing to the fact that it relies on a Honda engine, any engine related complication has to be taken up with Honda. For everything else, Simpson customer service is adept at handling things. A one-year consumer warranty is coupled with the pressure washer from Simpson and can be extended before the warranty runs out but it won’t cover the engine. AAA triplex plunger pump of industrial grade with ceramic coated pistons for added durability, frame is made of welded steel featuring tough steel axle for strength and durability. Exceeds the decibel limit at nearly 86 decibels, making it difficult to be heard while the machine is on. The Simpson PS4240-S PowerShot offers the best solution for tough, stubborn and challenging cleansing tasks. It is the preferred choice of contractors who depend on its durability and efficiency for cleaning the most challenging areas, given its portability and ease of use. Apart from the extra strong welded steel frame on which the equipment is mounted ensuring long life and uninterrupted performance, this model features high quality commercial grade engines backed by the Honda name that speaks for itself. With over 40 years of experience standing them in good stead, these pressure washers are 100% tested before leaving the factory premises.